Bienvenue à Montréal! Your Quebec road trip starts tomorrow, so hold off on picking up your hire car and start exploring this vibrant Canadian city ASAP. Before we get stuck in to the sights, just a quick note on arriving in Canada. If you're coming from further afield (aka not from the U.S. or Canada), we'd recommend flying in a day early if you can. This is the best way to get to grips with the time difference and catch up on some sleep, so you can make the most of Montreal and be well-rested for your first drive on day 2. It's definitely worth the extra night, if you can spare it. As the largest city in Quebec, Montreal can be a little tricky to navigate at first, so a trip on La Grande Roue (or Big Wheel) is a great way to kick things off by getting a feel for the city from above. 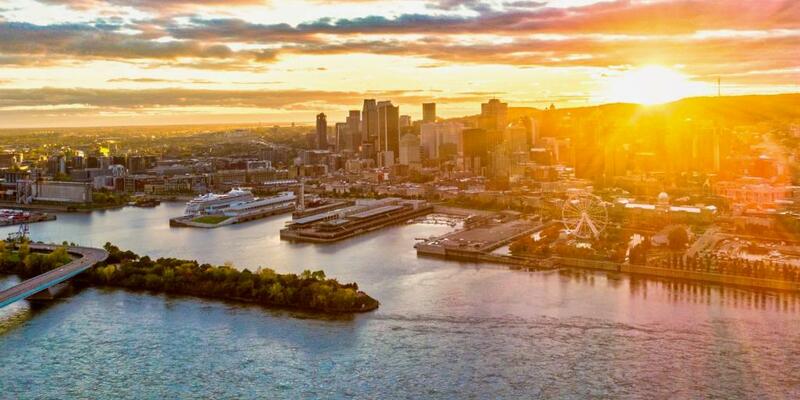 Opened in 2017 to mark the 375th anniversary of the founding of Montreal, this large Ferris wheel is the tallest of its kind in Canada, and offers panoramic views of the city from 60 metres in the air. Ride the wheel, see what landmarks you can spot, and take the first few pictures of your trip to get things started. An adult ticket for the wheel costs $25. 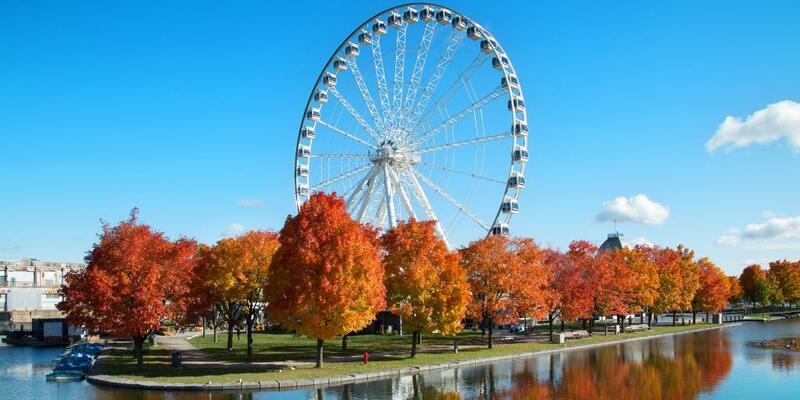 Another great feature of the wheel is that it's situated right in historic Old Montreal (or Vieux-Montréal), so go for a wander once you're back on solid ground. Made up of pretty cobbled streets and photogenic buildings, it's definitely worth a quick walk through on your way to the Botanical Gardens. Travel tip: Make sure you spot the silver dome of the Bonsecours Market poking through the rooftops. This leafy oasis in the heart of the city is considered one of the most important botanical gardens in the world due to its extensive collection of plants. The spacious garden serves to educate its visitors on horticulture and protect endangered species, and is a beautiful, well-kept green space that plays a key role in Montreal's cultural landscape. 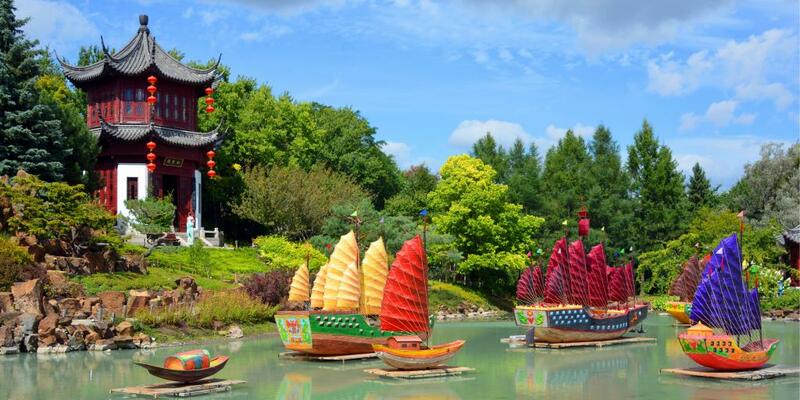 Spend some time admiring the colourful flowers, expertly manicured bushes, and exotic plants before heading to one (or all) of the three cultural gardens. The Chinese Garden - Demonstrating traditional Chinese landscape design, the plants, buildings and water features of the Chinese Garden all represent the harmony of yin and yang to create a feeling of calm. The garden is home to native Chinese plants, including a collection of bonsai trees donated to the garden. The Japanese Garden - Populated with Japanese plants, this garden's tea exhibition in the Pavilion takes centre stage. As well teaching visitors about tea plants, the traditional Japanese tea ritual is performed throughout the summer, and is a beautiful, calming routine to watch. The First Nations Garden - This garden's purpose is to celebrate the indigenous populations of Canada and their connection to the plant world. Alongside classic Canadian species such as maple trees, the garden is also home to medicinal plants and displays of traditional artwork and construction of these populations. Although we'd strongly recommend making it to all of them if you can, we recommend prioritising the vibrant Chinese Garden, which is by far our favourite of the three. Rest, grab some lunch and continue on to your next stop, St Joseph's Oratory. 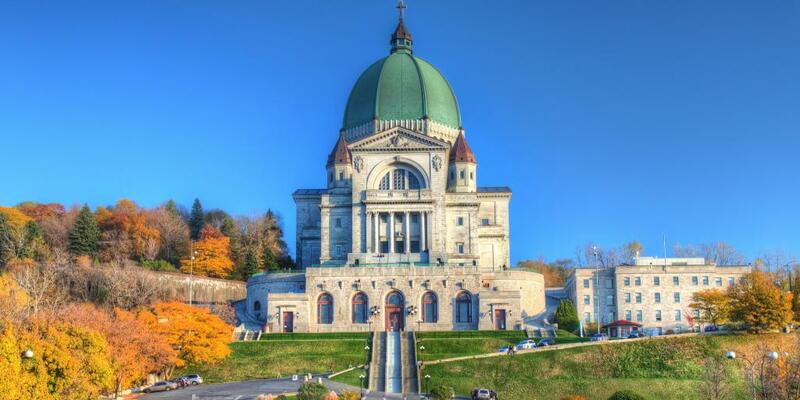 This Roman Catholic basilica and shrine stands tall on Mount Royal in the city. Not only is this one of the biggest churches in Canada, but it's thought to have one of the largest domes in the world, making it a pretty spectacular sight. Discover the shrine at your own pace, have a look at the exhibition of 200 nativity scenes from over 100 countries, gaze up at the dome from the inside, and catch an organ concert if you can. The Oratory also has really beautiful gardens, so go and soak up the views and rest your legs once you're done exploring. After you've made your way back into town from the Oratory and freshened up at your hotel, head out to try a classic Quebecois staple - poutine. This naughty fast food treat consists of French fries topped with soft cheese curds and slathered in gravy, and it's a favourite among locals and visitors alike. It may not be the prettiest of dishes, but trust us (and countless Canadians) - it's the ultimate comfort food. 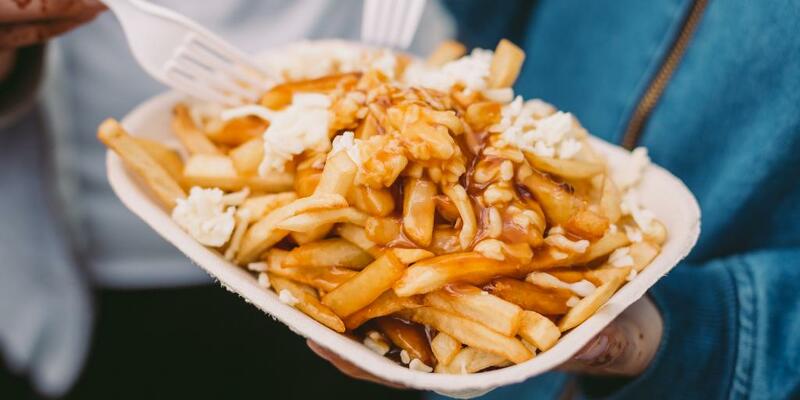 There are loads of places you can grab a portion of poutine, ranging from low-key cafes (the original poutine birthplace) to Michelin-starred restaurants, and we suggest you go for somewhere in between. La Banquise is a great option for its variety. Go for the classic to stay authentic, or choose from one of their 30 different flavour combinations if you're feeling adventurous. Afterwards, either waddle back to your hotel, or continue onto a bar to wash down your meal and wrap up day one. Wake up early on day 2, pick up your hire car and set off for Trois-Rivières. 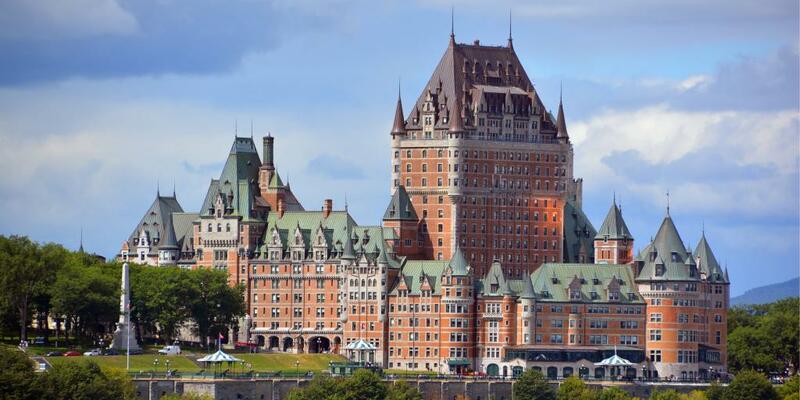 Your road trip will be centred around the St Lawrence River, where many of Quebec's towns and cities are based, and your first stop is around an hour and a half north of Montreal. Translated to Three Rivers, this city gets its name from the three mouths of the St Mauricie River that meet the St Lawrence River here, creating a really interesting formation of islands on the water. There isn't a huge amount to see in Trois-Rivières, so just spend the rest of the morning enjoying the Musée POP. This interesting museum aims to familiarise its visitors with the day-to-day life, society, and heritage of Quebec, presenting the local culture in a fun, modern way. There are a number of permanent and temporary exhibitions to get stuck into, but note that a few are only available to enjoy in French, so check with staff when you go in. One of the most striking permanent exhibitions is the opportunity to visit the Old Prison of Trois-Rivières, which was in use until 1986 and remains pretty unchanged today. A combined Prison and Museum ticket costs $21. After you've had your cultural fix, drive the car or walk a few minutes south to soak up the views of the St Lawrence River from leafy Parc Laviolette. Relax in the park, take a picnic if you fancy it, and be sure to check out Laviolette bridge before heading back to the car. Travel tip: Trois-Rivières is also known as the poetry capital of Quebec, and hosts an annual International Poetry Festival at the Maison de la Culture. The event usually runs for a month starting in mid September, so if you're around at that time you should definitely check it out. It's time to visit your first national park of the trip! We're easing you in by suggesting you admire this one from the car, rather than an energetic hike or bike ride. Following route 155 northwest out of Trois-Rivières, you'll join up with Chemin de Saint-Jean-des-Piles, which will carry you into the National Park. This road does a loop through the south half of the park and makes for a really lovely drive (it's a perfectly smooth tarmac road fringed by tall trees, lakes and hills - bliss). Travel tip: This is the perfect moment to crank up those road trip tunes as you soak up the scenery, so have an epic playlist on hand. If you want an even more spectacular view, we'd recommend stopping at the Le Passage viewpoint. There's a car park where you can leave the car and walk the final few metres through the woods to the lookout. Once you've managed to drag your eyes away from the beautiful views (don't worry, there's lots more where that came from), drive back into Trois-Rivières for the evening. Have another early morning and set off for Quebec City after breakfast to allow yourself a full day of sightseeing. The drive will take around an hour and a half continuing north up the St Lawrence River. The capital of Quebec province, Quebec City is one of the oldest European cities in North America, with some really interesting history and culture to discover. Aim to arrive mid morning, then check into your hotel, ditch the car, and kick off your sightseeing in the UNESCO World Heritage Old Quebec. This historic neighbourhood is technically divided into an Upper Town and Lower Town, however it all retains the same historic charm, so we'd recommend exploring it as a whole. There are so many sights to choose from that you probably won't be able to visit them all, so we've put together a list of our top recommendations so you can choose which ones you want to prioritise during your stay. This star-shaped citadel is located on the top of Cap Diamant (the highest natural point in the city), and was built by the British in the 19th century, prompting it to become known as 'The Gibraltar of North America'. 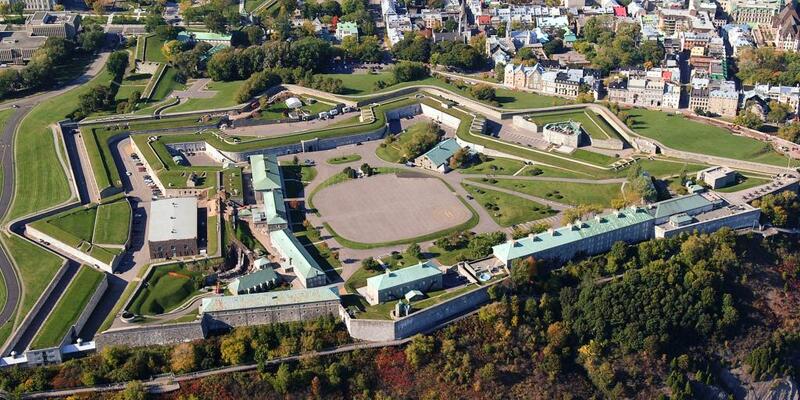 Its purpose was to protect the city from attack via the St Lawrence River, and it has since become an active military base. There are 24 buildings within the walls of the citadel, and visitors are allowed in to explore, however be aware that you must be accompanied by a guide before entering through the Dalhousie Gate. 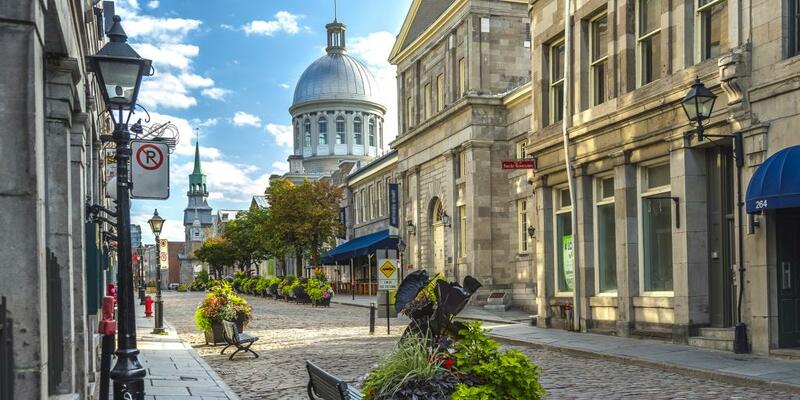 A visit to this cobbled square will make you feel as if you've been transported back in time to the beginnings of 'New France', with its beautiful stone buildings and the quaint shops lining its borders. The Place Royale isn't, however, just a pretty square to visit; it's also a really important historic site as the place where explorer Samuel de Champlain built his first and second habitations that signalled the founding of Quebec. 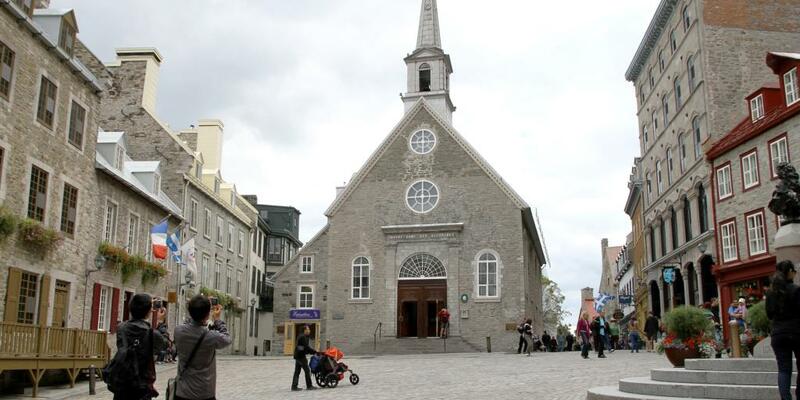 You'll find this picturesque church at the southern end of the Place Royale, built on what's thought to be the sight of de Champlain's habitations. This is one of the oldest churches in Canada with its original stone walls, and recent restoration has ensured that much of its colonial French character can still be enjoyed today. This vast, beautiful building is situated high up on a hill overlooking the city and the river. Although it looks like a castle, it's actually a hotel that was built in the late 19th to early 20th century for the Canadian Pacific Railway company. The hotel has hosted World War II conferences, was used as the film set for an Alfred Hitchcock film, and has undergone multiple improvements and refurbishments over the years, making it one of the most exclusive hotels in the province. It's enough to just take in the splendid exterior, but if you're feeling particularly fancy why not book a room for the night? You can book this hotel for a great price through our hotel booking platform - a great excuse to treat yourself (as if you needed one). If you're after even more historical monuments, some other great sights to visit in Old Quebec are the Ramparts (including the picturesque Porte Saint-Jean and Porte Saint-Louis gates), the Parliament building and Quebec City Hall. Make sure you grab lunch somewhere in between all that sightseeing (poutine round two anyone? 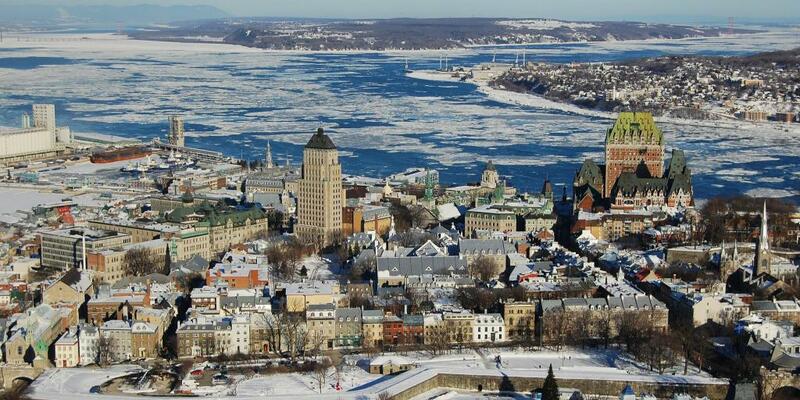 ), then head out of the old town to the Observatoire de la Capitale viewing platform for your final stop of the day. Located on the 31st floor of the Marie-Guyart Building (the highest skyscraper in Quebec City), a trip to the top will reward you with amazing views across the city and the river. Whizz to the top in the elevator, take in the scenery, and snap some pictures to bring your day 3 sightseeing to a close. Admission costs $14.75 for adults and is free for children under 12, and do note that the latest you can get the elevator to the top is 4.40pm (ahead of the 5pm closing time). There's an incredible foodie scene in Quebec City that you'd be wise to take advantage of during your stay, so be sure to indulge in a meal at one of the city's many amazing restaurants. Chez Boulay: Bistro Boréal - using ingredients from Canada's vast Boreal forest, the Nordic-style dishes at this stylish restaurant boast unique, earthy flavours like wild mushrooms and fir tree essence. If you're after something a little special, this is the place to go. Le Chic Shack - For something a little more casual head to gourmet burger joint Le Chic Shack. This spot is cosy yet chic (hence the name), and uses all local ingredients, right down to the burger buns which come from a nearby bakery. With something for everyone on the menu, this is the perfect informal spot to wind down after a long day. Tomorrow is going to be pretty active, so we'd suggest heading back to your hotel after dinner to relax and get some rest. Have a slow start on day 4 to recover from your past few early mornings, and make sure you eat a hearty breakfast ready for an action-packed day. Day 4 is all about embracing the season that you are travelling in, so we've selected a perfect activity to enjoy either in, or close to, Quebec City for each season. The weather in Quebec can vary hugely depending on when you visit, with temperatures anywhere between 10°C and 18°C in spring, reaching a pleasant 25°C in summer, dropping to around 15°C in autumn, and plummeting down to a chilly -3°C in winter. The activities you can do, therefore, will vary considerably depending on the season you're travelling in, so read on and choose the right activity for your trip. With temperatures at their warmest, this is a great opportunity to take to the water for a spot of classic Canadian canoeing. 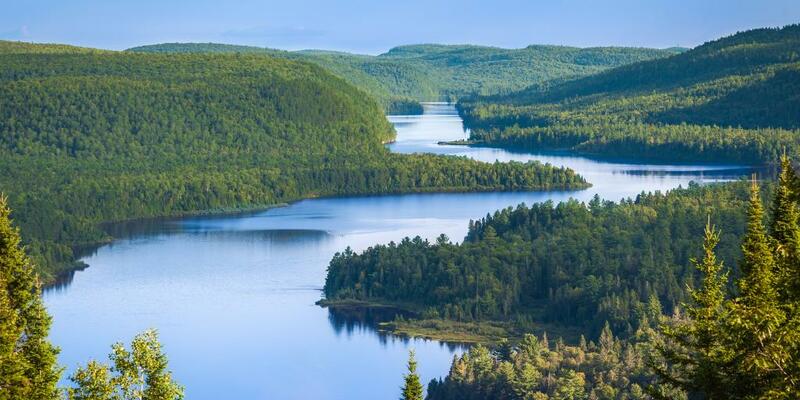 The Jacques-Cartier National Park is less than an hour's drive outside of the city, with the main road leading on to the scenic Chemin du Parc-National road, which will take you to the main car park. There are various options to choose from ranging from guided and self-guided river runs (which include exciting rapids), to going solo and renting a boat to paddle around on your own. If you opt for a river run package, go for the Parcours Sud option. This seven-kilometre stretch features three gentle rapids as well as beautiful calm water - perfect for a sunny day. This trip costs $57.75, which includes the rental of the boat and a shuttle service to the start point. It's also possible to hire kayaks and stand up paddle boards if you prefer, but be warned - it'll be a lot easier to fall in! 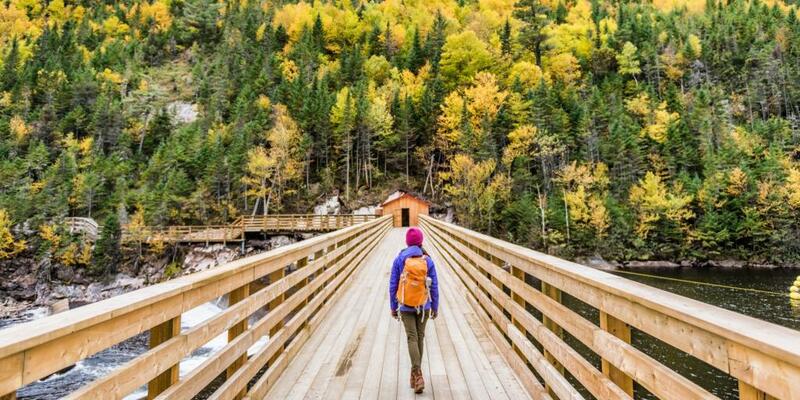 Although it'll be slightly chillier than in the summer, the Jacques-Cartier National Park becomes an orange-hued haven in the autumn, making it perfect for a spot of scenic hiking. There are over 100 kilometres of walking trails to take you through the park's most scenic landscapes, which vary from easy short walks to difficult uphill climbs, so you'll be able to find a hike to suit you whatever your ability. Visit the SEPAQ website or ask at the Visitor Centre for a list of routes when you arrive, and be sure to stop for a picnic lunch and snap some pictures of the beautiful fiery leaves as you go. Although we recommend you don't attempt your Quebec road trip in winter, we've included a wintery option just in case you do find yourself in Quebec City during the cold season. 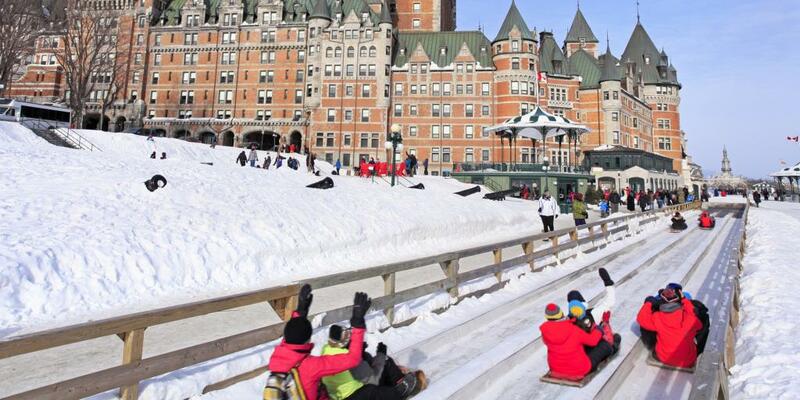 There are two great things about Quebec City in the winter: the prettiest blanket of white snow turning the city into a winter wonderland, and the Quebec Winter Carnival. Running towards the end of the winter at the start of February, this cheerful event sees winter activities popping up all over the city, including an ice palace, parades, competitive ice canoeing, and a snow slide. 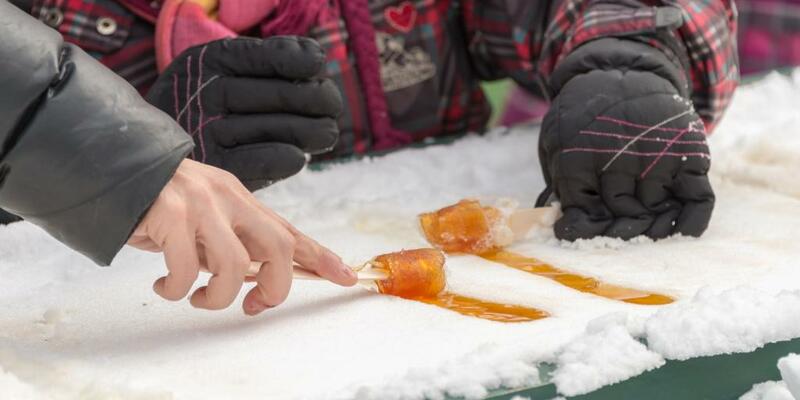 Be sure to take a breather from all the excitement to make some traditional maple taffy by rolling molten maple syrup through the snow onto a wooden stick - it's super satisfying to make and delicious to eat! Spring is, however, the true maple syrup season, so if you're travelling around this time be sure to experience an authentic cabane a sucre, or sugar shack. It's tradition in Quebec for families to flock to these sugar shacks when the maple sap starts flowing from the trees to celebrate the start of the syrup season. As well as giving you the chance to sample lots of sweet maple treats, the authentic experience includes a rustic all-you-can-eat home-style meal and lots of singing and dancing - it's a true celebration! We recommend you hop in the car and head to Le Relais des Pins on Orleans Island just outside of the city. 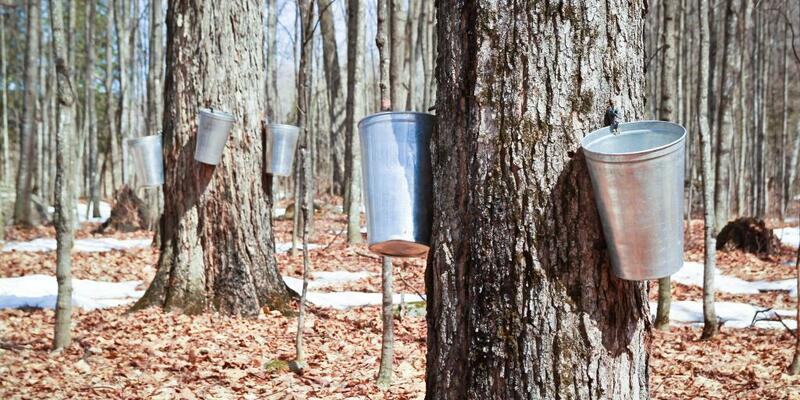 Here you'll be able to see the maple sap being collected from the trees, and get the chance to make some wintery taffy (you can make it all year round here). The meal at this sugar shack costs between $25 and $35 depending on when you go, and you can buy additional maple treats at the on-site gift shop, so be sure to stock up on the good stuff. As the day draws to a close, head back into the city and find another amazing spot for dinner, go for a drink to toast a great day, then collapse in your hotel room and get some well-deserved rest. The afternoon of day 5 is devoted to whale watching, so set off early in the morning to give yourself enough time to make it to Tadoussac around lunch time, factoring in a stop at Montmorency Falls. 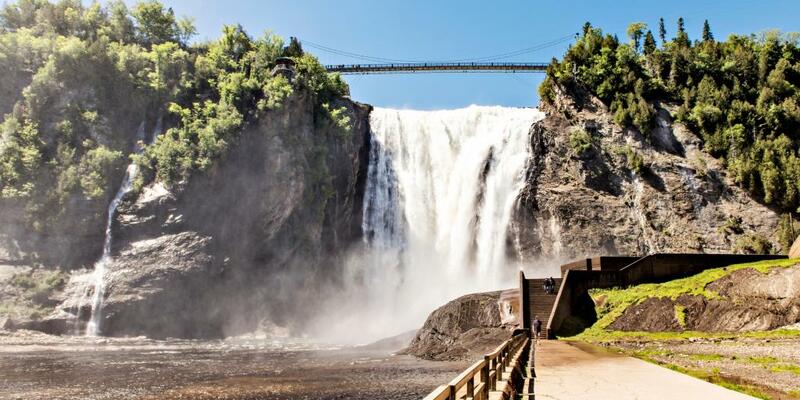 This beautiful waterfall is just a 15-minute drive outside of Quebec city, and, with a height of 83 metres, it's actually taller than Niagara Falls, making it a very worthy pit stop, if you ask us! Leave your vehicle in the car park at the foot of the falls, then make your way to one of the viewpoints to enjoy this epic sight. The best places to stand are the Vista Point at the bottom of the falls, the Observation Tower at the top, the suspension bridge that takes you right above the water, and the adrenaline-inducing zip-line. If you fancy going to one of the high-up viewpoints, we'd recommend you take the cable car to the top of the cliff which costs $12.18, or if you're travelling as a couple opt for the $35.44 combined ticket which includes unlimited cable car rides and parking. Once you're done at the waterfall continue on to Tadoussac. The drive will take around three hours, and make sure you look out for the impressive Sainte-Anne-de-Beaupré Basilica during your journey (you won't be able to miss it). Note: The last leg of the drive involves a short ferry ride across the Saguenay River. 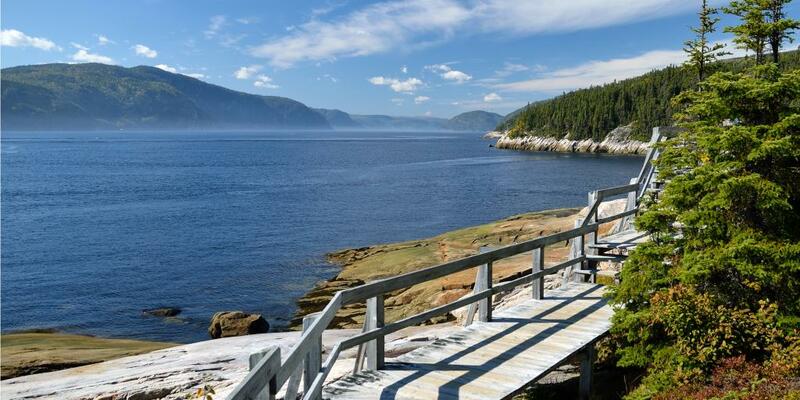 Your arrival into Tadoussac marks the beginning of a nature-filled few days, so dig out your comfy shoes and sensible clothes and head to the river for some whale watching. 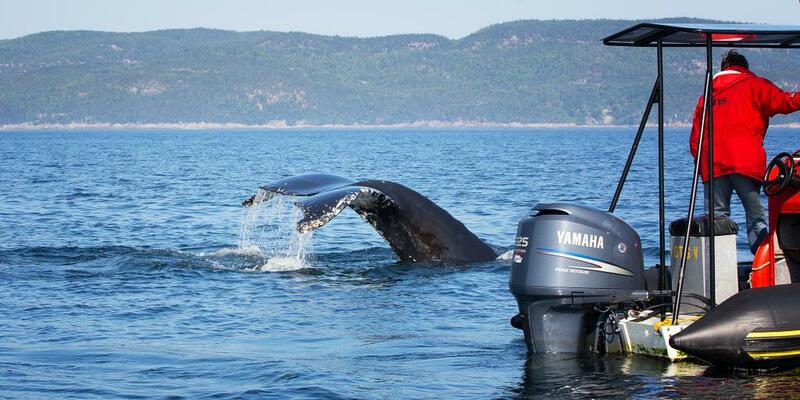 This small town is thought to be one of the best places in the world to go whale watching because it sits at the point where the Saguenay and St Lawrence Rivers meet, meaning there are strong currents that draw in lots of plankton. Whales feed on plankton, so many come to this particular spot, making it the ideal place to try and see as many as 13 different species, including the endangered beluga and famous blue whale. Zip through the water on an agile zodiac boat - These inflatable boats sit low on the surface of the water, so you really feel close to the whales. Zodiacs can also travel quickly and cover large areas, so it's easy to move to a new spot if you're not having any luck. AML Cruises offer 2.5-hour zodiac expeditions for $79.99. Scan for fins from a big boat tour -If you're after a more stable trip with facilities, then opting for a tour on a larger boat is a good idea. Although you can't get as close to the whales, these tours usually last longer and can be much more comfortable, particularly if you're likely to find getting in and out of a wobbly boat tricky. AML Cruises also offer boat tours starting at $69.99 for three hours. 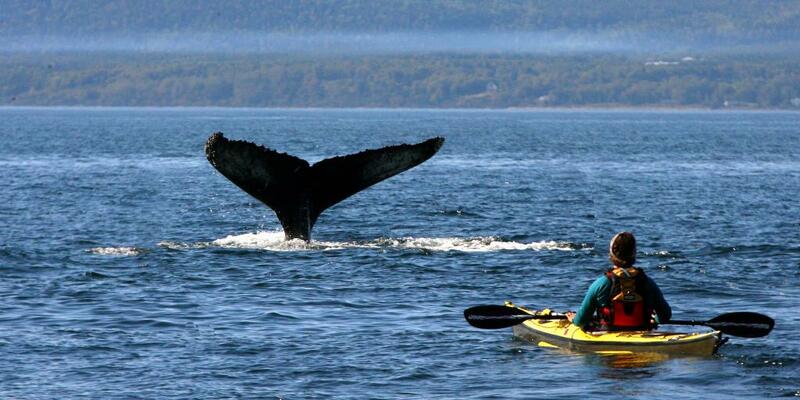 Get up close and personal with the whales from a kayak - With no motor to scare the whales off, it's possible to have a more intimate encounter with these amazing mammals if you opt for a kayak. Paddling out into the stunning scenery with only the whales for company is a once-in-a-lifetime experience we'd thoroughly recommend. You can book half-day kayak tours through Mer et Monde for $68. Stay on dry ground and watch from the shore - Of course you can always see if you can spot some whales from the shore; just try and get hold of a pair of binoculars to make sure you get the best view. Whichever option you go for you'll be sure to make some unforgettable memories; just one piece of advice - wrap up warm! Even if it's hot and sunny on the shore, temperatures can drop by a staggering 10°C out on the water, so don't forget to take some warm clothes with you. Note: Most of these boat tours are only available between May and November, so try to travel in this time frame so you don't miss out. This is also when the most whales are in the river, increasing your chances of seeing some. Despite being a small town, Tadoussac isn't short of places to have a great meal, so freshen up at your hotel and head out in search of something delicious. Our top pick for Tadoussac is Chez Mathilde. Although it may look like a quaint, simple eatery from the outside, the dishes served up are something special, from the fresh local produce right down to the creative flavour combinations and beautiful presentation. If your budget will stretch to it, we'd recommend opting for the tasting menu ($75) so you can try as many morsels as possible, but sticking to a couple of dishes is also amazing, with options ranging from Quebec deer to freshly caught seafood. Book a table online to avoid disappointment, and have a long and slow dinner reminiscing about your day with the whales before strolling back to your hotel. Pack up in the morning and head off to the Saguenay Fjords National Park; day 6 is another nature-filled day to make the most of Quebec's stunning landscapes. Because this area is so untouched there aren't many roads, meaning you'll have to double back on yourself slightly to get to the national park. This may sound like a pain, but the drive should take less than two hours so it won't feel like much of a detour. 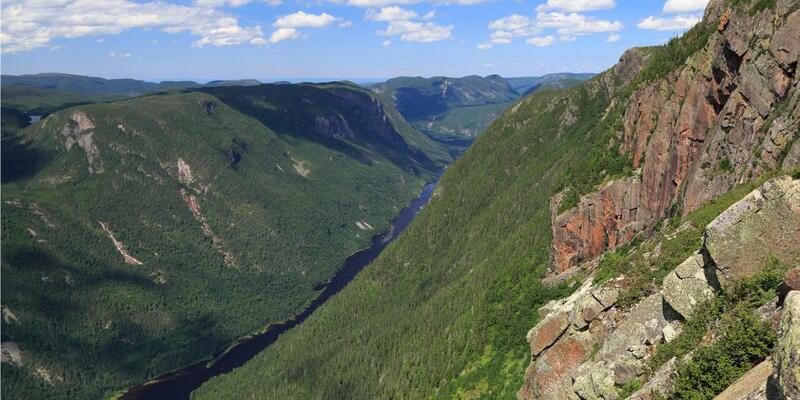 This spectacular national park borders a section of the Saguenay River, and is a great place to get away from any towns, to immerse yourself in nature, and get stuck into some outdoor activities. To fully make the most of this, forgo a hotel tonight and camp under the stars instead. Hear us out on this one. Because the park is isolated from both Tadoussac and Saguenay you'd have to drive quite a long way to reach any hotels, so to maximise your time here it's best to stay the night. Plus, once you've spent the afternoon exploring, we bet you won't want to get back to civilisation, so camping really is your best option. We'd recommend that you set up camp for the night at the Baie-Éternité campground, which is close to the park entrance on Rue Notre Dame. If you haven't been able to bring a tent with you, or the thought of camping is terrifying you just a little bit, then don't worry - the campsite offers both ready-to-camp (essentially 'glamping') plots and fully-equipped chalets, so the experience will be really comfortable and fun! There is also a small convenience store nearby where you can buy food, in case you didn't have a chance to bring provisions with you from Tadoussac. Once you've settled in to camping life and had a bite to eat, pick an activity to fill your afternoon. Seeing as you've already done canoeing and hiking, we've picked some alternative suggestions for you to choose from. If you're feeling brave and adventurous after discovering your new passion for camping, then take to the Via Ferrata for a spot of climbing. Found in various locations around the world, a via ferrata is essentially a set climbing route with ropes and handles fixed into the rock to make the climb achievable, fun, and accessible to almost anyone. 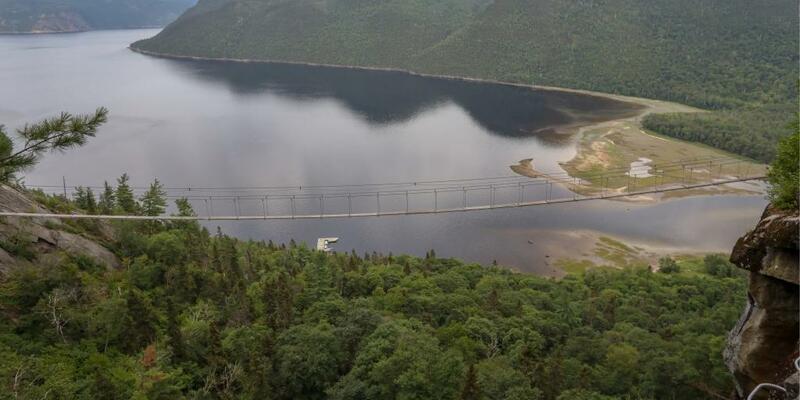 There are three different routes you can take on the Saguenay version, and the La Passarelle is the ideal one to try - it's not too difficult, but it's guaranteed to give you a hefty shot of adrenaline. Climb up the rocks and cross the 85-metre-long suspension bridge for incredible views over the water. The experience costs $49 and can be booked via the SEPAQ website. If you're feeling adventurous but would rather stay at ground level, then why not go for a bike ride? There are loads of scenic bike trails running through the park and the surrounding Saguenay River area that vary in length and difficulty, so it's easy to pick one to suit your mood or ability. Lots of the main trails close to the campsite are pretty difficult because the national park is quite hilly, so if you're after something a bit gentler or more family-friendly, we'd suggest hopping in the car and driving west to Lac Saint-Jean at the other end of the Saguenay river. Visit the Experience Velo website for a useful map and guide to all the possible routes. You can hire a bike a few miles east of the campsite from Fjord en Kayak for $20 for three hours, or if you're driving to the lake, pick one up from Équinox Aventure for $20.90 for four hours. Note: Équinox Aventure only have 40 bikes for rent, so in busy seasons it's best to call ahead to make sure there are still some available. 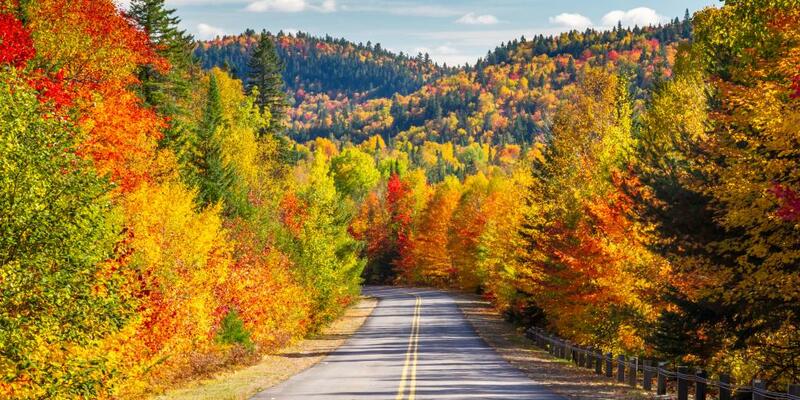 If you're in the market for something less strenuous, then a scenic drive to Lac Saint-Jean is an equally good option. Connect back up with route 170 and drive west along the river until you get to the lake. It will take the better part of two hours to get there from your campsite. For the most scenic route, join up with route 169 and head to the north side of the lake, stopping in Pointe-Taillon National Park to take a break and enjoy the views - there's a great lake beach where you can relax for a bit. Yes, camping means you can't just pop to a restaurant for some dinner, so cook something easy to fill you up after an active day (go for pasta - speaking from experience it's pretty much a camping staple). Although being isolated is harder work in the eating department, it's also a huge bonus when it comes to stargazing. Without any light pollution from nearby towns and cities, on a clear night you should be able see an unforgettable smattering of stars in the sky. Grab some blankets, find a break in the trees and lie on your back gazing at the stars; we guarantee that if you haven't warmed to camping yet, you will after this. Seeing as you're on a roll with all this nature stuff, why not squeeze in one more national park before you head back to Montreal? Once you've had breakfast, bid farewell to your tent and hit the road for the Hautes-Gorges-de-la-Rivière-Malbaie National Park. After driving south from the campsite and connecting back up with route 170, you can actually head either east or west to get to the park - you basically need to end up in Saint-Aimé-des-Lacs to find the entrance. Heading west towards Saguenay and picking up route 381 is the better option as it makes the day's driving into a circular route - plus, the 381 is a really beautiful road. You're not allowed to drive your own car around the park, so leave it at the Félix-Antoine-Savard Discovery and Visitors Centre and pick up the free shuttle bus, making sure you grab some food from the centre's convenience store for a picnic. The shuttle bus runs between the Félix-Antoine-Savard Discovery and Visitors Centre to the Draveur Visitors Centre eight kilometres away, stopping at all the hiking trail start points along the route. These hiking trails come in all shapes and sizes to suit all abilities. Assuming it's your first time here, we suggest the intermediate level Le Riverain trail. Taking hikers to some incredible viewpoints of the valley, this gravel trail is pretty easy to follow, with ample picnic spots along the way where you can take a break and marvel at the park's beauty. You can either start this trail at the Félix-Antoine-Savard Discovery and Visitors Centre (making the route 10.8 kilometres), or you can shorten it slightly by starting at the Le Cran Campground (10.2 kilometres) or the Des Érables bridge (8.8 kilometres), which are easily accessible via the shuttle bus. This is your last proper outdoor activity of the trip, so make the most of the beautiful park and have a relaxed picnic before heading back to the car later in the afternoon. You'll be crossing the river in the morning to drive back to Montreal via the Trans-Canada Highway, but for now just drive the short distance to La Malbaie for the evening - you'll probably be really tired and in need of a hot shower and a comfy hotel bed before you go any further. 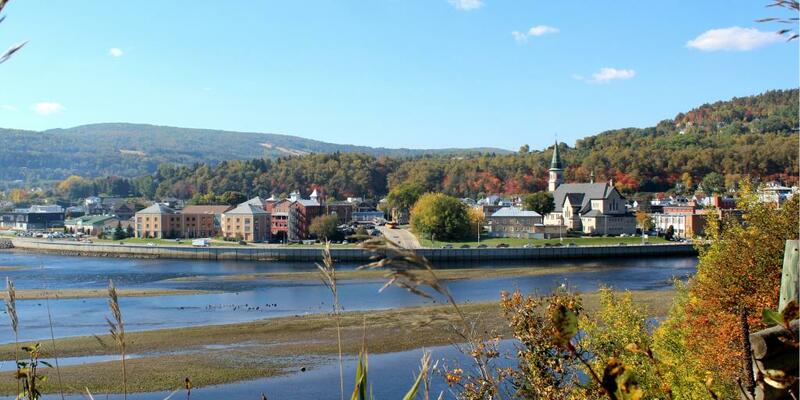 This sleepy riverside town has heaps of maritime charm, making it a great place to unwind after your adventurous few days exploring Quebec's national parks. There aren't many sights to see here, so don't feel guilty about putting your feet up in your hotel room for a few hours before it's time to head out for dinner. When the hunger pangs set in, Vices Versa is one of the best places to go for a great meal in La Malbaie. Run by a local couple, this restaurant offers two menus, one cooked by each of them, which showcase their unique styles and flavour combinations side by side. Most of the time both menus will use the same principle ingredients but with a slightly different twist, making it a really exciting, interesting place to understand, as well as enjoy, the flavours you're eating. Portions are on the small side, so consider ordering a selection to share, and see if you can decide which menu you like more as guests are also welcome to visit the kitchen and offer their feedback to the chefs. After dinner you'll probably want to call it a night, so head back to your hotel and get some rest ahead of your long drive back to Montreal tomorrow. Day 8 is essentially about getting back to Montreal before you need to make your journey home, and with the full drive taking around five and a half hours it's going to feel like a long day. But don't worry, we've made sure you'll have plenty to do along the way so that day 8 is more than just a boring motorway slog. The ferry ride will take around 65 minutes and set you back $47.10 per car, with an extra $19.80 per passenger. Be aware that it doesn't run between January and April, so if you need to travel in these months, you'll have to drive south and cross the river once you get to Quebec City. The Trans-Canada Highway is an epic road that stretches across all ten provinces of the country, all the way from the Pacific Ocean in the west to the Atlantic in the east. 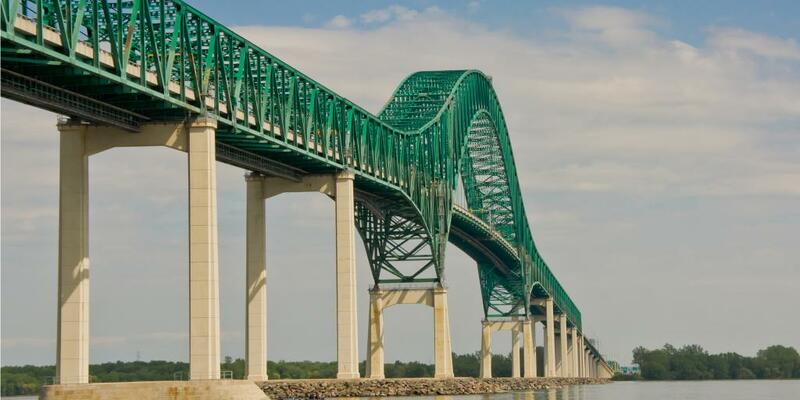 It's a pretty iconic road to drive, so pick up some road trip snacks and connect up with it just outside of Rivière-du-Loup to start your journey towards Montreal. Admittedly, this road is more of a big motorway than the leafy locals roads you've been taking so far, but there's still plenty of greenery about. Plus, if at any point you start to get bored, there are plenty of road trip games you can play to keep everyone in the car happy. Make sure you also look out for the road signs. 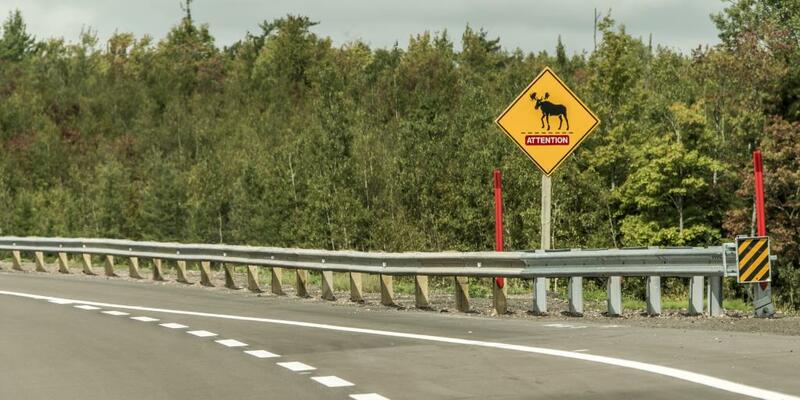 There are some pretty entertaining ones to remind you that you're still in this wild, beautiful part of the world - the 'moose crossing' signs are our favourite. Because the full drive will take approximately four and a half hours (after you've got off the ferry), you'll need to make at least two stops along the way, and the small town of Beaumont makes a great first stop. 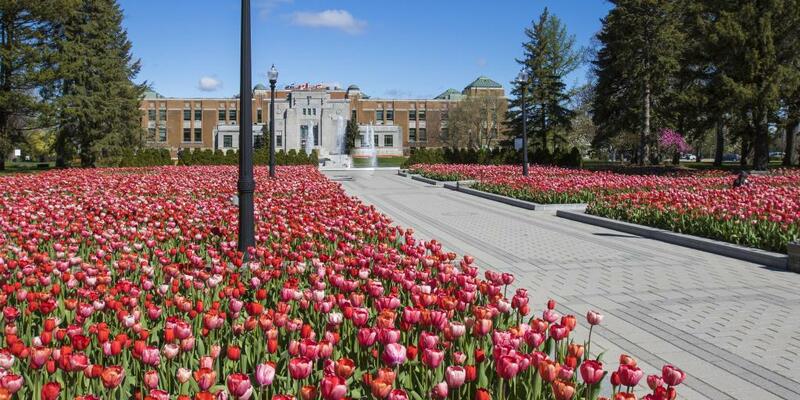 Located on the bank of the St Lawrence River just north of Quebec City, this leafy town is a great place for a pit stop if you don't fancy driving into the city, and is much greener and quieter than its built-up neighbour Levis. Have a quick half an hour stop, wander down to the river and breathe in some fresh air before getting back in the car. 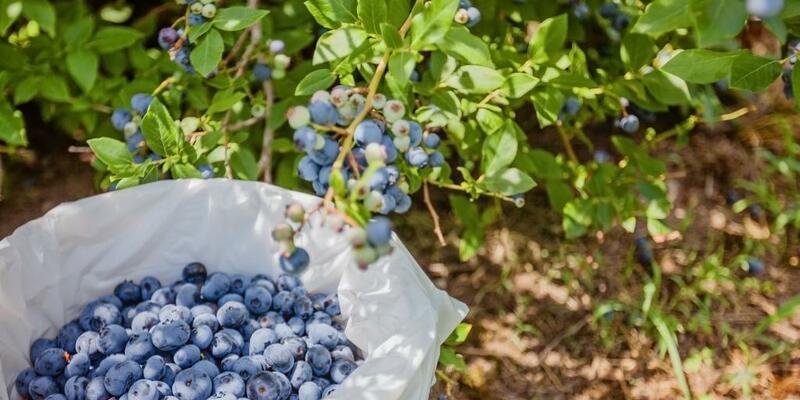 Another hour down the road past Quebec City you'll reach your next stop, La Vallée Bleue, a blueberry plantation where you can pick your own fruit and sample various products made with crops (including amazing blueberry wine). It's also really child-friendly - the kids will love running through the orchards picking as many berries as possible! Stop for a little longer here than you did in Beaumont, then when you feel suitably refreshed, drive the final two-hour stretch back to Montreal. Check into your hotel for one final time, regroup after the drive, then head out to experience Montreal's amazing bar scene to toast your epic Quebec road trip. If you can get in, we'd recommend going to tiny El Pequeño Bar in the old town for a cocktail. This bright and cosy bar is thought to be Canada's smallest, with space for just a handful of people to enjoy a drink at a time. The menu is just as small as the bar, with four classic rum-based cocktails to choose from, as well as mouthwatering Cubano sandwiches that have been specially perfected to an authentic recipe - a great addition to your cocktail if you haven't had a chance to grab dinner beforehand. If it's already reached its nine-person capacity, then its sister bar The Coldroom is just next door, and has an amazing (and extensive) cocktail and wine list. The speakeasy-style entrance and friendly bartenders add to the effortlessly cool vibe at this bar, and it's the perfect place to raise a celebratory glass to your trip. What you do on day 9 of your Quebec road trip really depends on your flight time, so we're leaving today's itinerary in your hands. Whether that's doing a speedy visit to the sights you missed on your first stop in Montreal, snacking on a final cheeky plate of poutine, or having one last gaze over the St Lawrence River, you'll be sure to go home with some amazing memories of an unforgettable Quebec road trip. 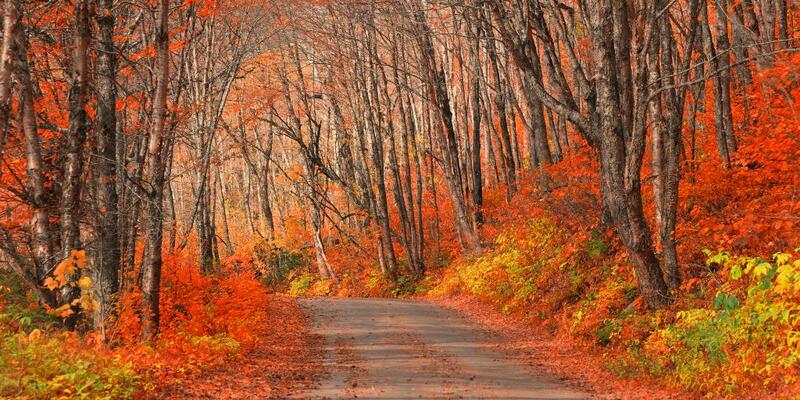 We'd recommend that you only attempt this road trip between May and October to avoid the cold season. Quebec's temperature plummets in the winter months, bringing deep snow and causing stretches of the waterways to freeze. Due to the adverse weather, not only will you have a hard time driving, but many attractions and transportation systems (most notably ferries) have reduced services, affecting how much of our itinerary you'll be able to enjoy. 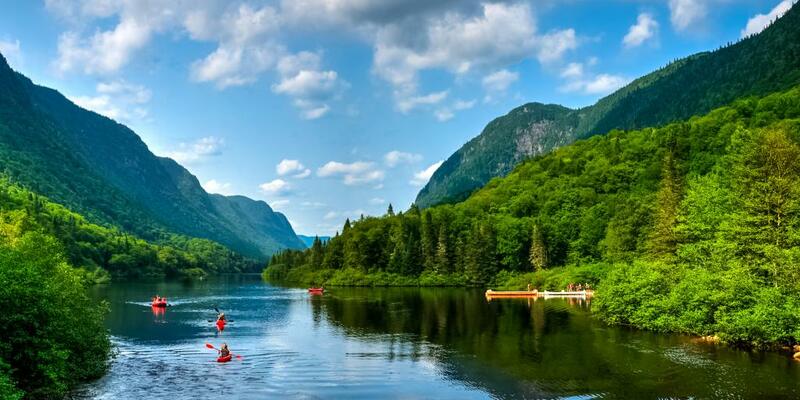 All of the national parks in the province are managed by the government agency SEPAQ (Société des établissements de plein air du Québec), so for information on entry, activities, parking and camping head to their website. Note that you will have to pay a fee to enter each park, details of which are also on the website. The further away from the river you get, the fewer roads there are to drive on, so expect to stick to the main roads and have to double back on yourself at times to get from A to B (this mainly applies to the Saguenay section of the drive). Although the majority of the province is French-speaking, English is widely spoken and you shouldn't have any issues if you can't communicate in French, particularly in Montreal and Quebec City. That being said, it might be a good idea to carry a phrasebook for when you visit the smaller towns, just to be on the safe side.